Since the 60s under Sheikh Rashid bin Saeed Al Maktoum, the Emirate of Dubai has developed the city of Dubai at an extraordinary pace, culminating in the phenomenal growth seen over the last couple of decades. From a humble trading port, Dubai has been transformed into one of the most popular luxury tourist destinations in the Middle East, in addition to being the region’s undisputed financial hub. To achieve this, the Emirate’s leadership not only poured in copious investment funding (predominantly derived from the oil discovered off Dubai’s coast in 1966) but also established a multitude of Special Economic Zones across the city, to foster business growth and attract foreign investment. Numerous technology, finance, and media companies have been established in Dubai as a result, forming a receptive environment for Bitcoin. Should a similar approach of investment and deregulation be applied to Bitcoin and blockchain projects as was applied to the city itself, Dubai could bring equally amazing growth to the cryptocurrency space. There are several encouraging signs which point to the likelihood of such an occurrence, as the government is pioneering numerous blockchain projects while the UAE’s sovereign wealth fund remains “open-minded” in regards Bitcoin investment. Under the ambitious UAE Blockchain Strategy 2021 announced in April 2018, the region intends to become the world’s first “government on the blockchain,” with half of federal transactions made via cryptocurrency by the aforementioned date. Court of the Blockchain, which ultimately aims to bridge the gaps between the traditional legal system and blockchain-based smart contracts. For now, the focus will be on reducing paperwork and realizing greater legal efficiencies. The Dubai Blockchain Business Registry Project, developed in partnership with IBM, will create a blockchain-based Unified Commercial Registry to better issue, store, and manage trade licenses. The Dubai Silicon Oasis free zone will be the first to implement the technology. The Dubai Land Registry’s blockchain property database, which serves to record property ownership, secure property-related money transfers and facilitate communication between property owners, tenants and utility providers. In April of 2018, Bitcoin was declared acceptable under Sharia Law by Muhammad Abu-Bakar of the Indonesian firm, Blossom Finance. This has opened the door to Bitcoin and cryptocurrency investment by Muslims around the world. Note that this declaration should not be presumed to extend to each and every cryptocurrency, as some contain an element of interest earned on loans. To the best of our knowledge, none of the coins offered by Coinmama fall in this category. 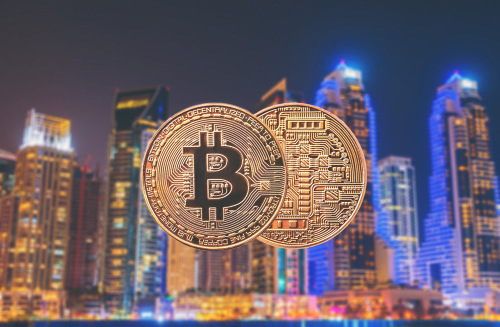 Although Dubai and the UAE have clearly embraced blockchain, the legal and tax status of Bitcoin is still somewhat unclear. There existed some perceived contradiction existing between the UAE central bank’s ruling which prohibited “virtual currencies” and emCash, planned as the official state cryptocurrency of Dubai. However, the central bank’s governor later clarified that the prohibition does not extend to cryptocurrency. According to legal experts consulted for an article in Gulf News, the buying and selling of Bitcoin is considered a “tolerated practice” within the UAE. While Bitcoin is not explicitly legal within the region, regulators will not prosecute those who trade in it. The Dubai Financial Services Authority has publically warned against the high risk of cryptocurrencies but washed its hands of their regulation. According to the Khaleeji Times, the taxation situation regarding cryptocurrencies is currently unclear. Dubai is likely to emerge as a regional or even world leader in the implementation of blockchain technology. However, this should not be taken to imply that all things crypto are permissible. We at Coinmama recommend that our valued clients in Dubai and the UAE conduct their own research into local taxation laws and all other regulations which pertain to cryptocurrency.